(Phys.org) —A research team made up of Paul Charbonneau, a physicist with the University of Montreal and Piotr Smolarkiewicz, a weather scientist with the European Centre for Medium-Range Weather Forecasts in the U.K., has created a new kind of computer simulation of the sun's energy flow. 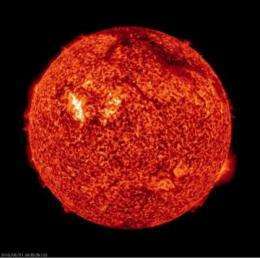 In their Perspective article published in the journal Science, the two describe the solar engine deep within the sun as its "heartbeat" and suggest that it underlies virtually all solar activity. To gain a better understanding of how the sun works, the two researchers created a simulation that models the sun's entire magnetic field activity—no small feat. They ran their simulation on University of Montreal supercomputers which are connected to a larger network across the city. In so doing, they observed that though the sun as a whole experiences an 11 year cycle of solar polar reversals (as noted here on Earth by the periodic nature of observable sun spot activity), zonal magnetic field bands undergo a polarity reversal on average every 40 years. Scientists have for years been trying to model the sun, but thus far attempts to do so have been lacking. The problem is that there is so much going on and the sun is so huge—to simulate it all requires more computing power than is available. At the root of all the simulations is turbulence, which is where a gas or fluid flows in a chaotic fashion. The new model shows that turbulence in the sun comes from within and flows outwardly, dissipating into ever smaller vortices, but it, like other simulations can only model this dissipation to a certain degree. At some point, the vortices are as small as just meters across and thus are too small to include in a model because there are just too many of them. The simulation built and run by Charbonneau and Smolarkiewicz goes as far as modern computers are able and shows the suns' action as a dynamo—where the amplification of a magnetic field is self-sustained due to fluid motion action. Studying the sun and how it works is not purely academic, of course, learning how to accurately predict solar flares—when they might occur and how large they might be, would be very useful as the world becomes more and more dependent on sensitive electronic instruments that can be adversely impacted by events on the sun. No, the problem is the weak hypothesis that assumes turbulence and a magically created magnetic field by fluid mixing as being the source of the phenomenon. Solar physicists who formulate these models are torn between their laboratory observations of magnetic fields and the cosmology which peer reviewers will sign off on. In the lab, magnetic fields and electric currents go hand-in-hand, but the cosmological framework dictates that we live within a gravity-dominated universe which at best can be a "magnetic universe" -- but not an electric one. The public, as a result, gets just a glimpse of all possible explanations -- and the glimpse we do get is the result of a social compromise between PhD's, guided by the least unsavory violation in physical principles. In a general sense, this compromise will tend to accept what we can see (through worldview goggles), and make assumptions on things that are harder to observe. Given that large-scale movements of electrons are incredibly difficult to see without trying, the preference is to make assumptions about the electrons. But, this assumption will eventually have to be checked by somebody. I found some new research on magnetism that might shed some light on this subject. There are 3 ~ 1 hr vids. I fond them worth the watch. If one believes the link that was provided, one might think that a David Lapoint of CERN has discovered amazing new phenomena. In fact, Mr Lapoint is unknown at CERN (so why did he imply that he was in the link?) and appears to live in California: some commute! The device shown in the link also bears a close resemblance to Mr Lapoint's perpetual-motion gadget (patent applied for) which is supposed to extract energy from magnets (yep, the usual story). But it is not only a perpetual motion machine! Lapoint claims that "these charged fields are also great for human, animal, life, etc. Within the 7700 sq.ft. building there is an amazing air quality". Course those are pretty neat videos. Hey cantdrive why aren't you up with Lapoint's stuff? He has some pretty videos going. How's that sunspot/earthquake thing coming along for you BTW? I set you up with the earthquake site so you could keep track, but you have't said how your research is going. Hey, isn't he the guy who used to post here about a new & improved version of the electric universe model? I forget the moniker he used, letter/number thing.... He used to get in some real heated "I forgot more than ya will ever learn" sort of debates with cantdrive. He us told over and over that in November '12 he was going release something that was change the science world view for ever. See my above post. He and cantdrive had a sharp falling out here on WHO had actually done any real science with plasma in a lab. Hilarious! I actually saw some of that on another site, so I was being a bit facetious lol. Apparently some from the EU club tried to recruit Lapoint, and he didn't take to it very well! At first they were all "wow this stuff is revolutionary and clearly supports Wallace et al yada yada" and by the end the two camps were accusing each other of genocide, pedophilia and being father rapers. As I said, hilarious! Your rant is entirely mis-placed here. Solar physics is highly dependent on electricity and magnetism, as the real Alfven was awarded the Nobel for showing. lol. Most people call it convection. You know, warm air rises, cool air falls. It's not magic. You can ask any average 5th grader about it if you want to know more. The major issue I had with A2G/Rubberman/Twin is the manner in which the magnetism is created. From an EU POV, it is the movement of the particles (current) which creates and modifies the fields, the triumvirate (one) above suggests the magnetism is inherent in the particles and somehow on larger scales the sum of all the magnetic particles creates a super magnet so to speak. Also there was some implication that "magnetic turbulence" was the cause of currents in a plasma, but as Alfven pointed out years ago, plasma turbulence or noise should not be assumed to do the work but is instead a result of the particle movement. Beyond that, he's got some good ideas and bad, and one way to look at things it seems. Hey, we finally found something to agree on. Magnetism is not a fundamental (inherent) property. It is dependent on "something" (an electric charge) moving. Moving doesn't mean inherent, as ya pointed out. IMO just the fact, that the most of matter flowing inside of Sun is charged rather stabilizes that flow hydrodynamics with eddy currents instead of introducing the pace into it. For example, the solar sunspots are vortices rising through solar plasma, which wouldn't be stable without their magnetic field and they would dissipate fast. Therefore if some oscillations happen with solar plasma flow, their source cannot be of (electro)magnetic nature. This is an example of high-level intuitive logic, but it could be verified easily if we would compare the turbulent flow of particles, the charge of which we would increase gradually. At the very end the whole flow would remain locked in quantum vortices similar to those, which we can observe inside of superconductors. Haha nice catch! I'm betting he won't get it. Your rant is entirely mis-placed here.Solar physics is highly dependent on electricity and magnetism,as the real Alfven was awarded the Nobel for showing. Yes, but based upon the erroneous belief that a core dynamo is the extent of the electric circuit. And Alfven received his Nobel for MHD, although applied to solar plasma it is not primarily based upon the solar aspect. If solar physicists would looked to Alfven's solar circuit model many of the "mysteries" of solar physics would evaporate. Oh, you mean the convection that was recently observed to falsify the currently accepted models of solar heat transfer? Right, I forgot about that non-issue. Wow, there are some great posts here! Jupiter and Neptune control the Sun, who knew? I'm no cosmologist, though, so what do I know? On the other hand, I'm no astrologer, either. I'm waiting now to hear how the approach of Barnard's Star is affecting the Great Red Spot. I must confess that I regret sounding so snarky in my last post. It's just that I find it very difficult to believe that the presence or absence of planets, especially distant planets, has effects of this type on a star. That would be the same as saying that stars without planets won't show similar behavior, and while as far as I know we don't have any observational evidence for that either way, I just can't find it credible. I'm not smart enough to have a point of view to defend on these issues. I stumbled across the vids I linked & thought ppl might find them interesting. I watched all three hrs of them, they certainly present some alternative ideas about how things might be organized. No worries Twin, and don't be too put off by comments you get on some of this stuff. There are a lot of wackey theories (and even whackier theorists) on these forums, and we often see things come up over and over. (and over. And over) So sometimes the innocent get caught up in it :). Post your questions, but beware of the pet theories floating around. Non scientist here: Loopy magnetism of the kind described by R Duncan U of Texas, where 4.4*10 to the 13 power Gauss rules is what makes up our sun. Where normal magnetism is created within a greater magnetism, loopy magnetism is created in a relayering gas event similar to a what happened when pure gas was expelled by the collapsed center of the former Magellanic spiral galaxy and pooled amid established suns of the former spiral. Magnetars are the result. If centered exactly amid the pressurized pure gas you get a magnetic star so dim it cannot be seen and one that ticks down with the precision of a swiss pocket watch. As a professional physicist, I do not understand the purpose of sites like this one. Professionals do not need the input of amateurs, but amateurs MIGHT learn something from professionals here IF it were not for all of the loonies who get in the way. What we need are sites that do nothing but make fun of crackpots and use their misconceptions and ignorance in order to guide students who really want to be given solid information (crackpotwatch makes a feeble gesture in this direction). And why give the nuts any right to reply; they already have plenty of alternative outlets for their nonsense. Science is not democratic; there is an equal right to free speech, but NOT an equal right to be believed. Perfect example above, these "plasma physicists" were taught magical magnetism theory that doesn't require electric currents and where "magnetic field lines reconnect". They are just using the flawed knowledge they were taught, professional or not. You're right science is not democratic, as such it doesn't matter one iota nor does it give credence to a theory because that's what most of the "professionals" believe. The search for knowledge about the sun is most important thing to do, so every theoretical model must be considered. The Matrix/DNA Theory has an astronomical model obtained by different method (comparative anatomy between astronomical,atomic and biological systems) and my observations are: 1)Sun was produced by reproduction process,while the first original stars were produced by symbiontic process (as cell system had two process of formation). But, the mechanisms of the first process are kept by young stars like the sun, like evolution obeying the mechanisms of life's cycles. These heartbeats must be modeled by these inherited life's cycles;2)Sometimes what we see as turbulence hide a deep order, as we are learning at quantum mechanics. The fluid flows are not due chaotic motions, since that the ancestral astronomical systems were ordered. See Matrix/DNA models a suggestion how it were ordered for trying to grasp the order behind the chaos;3)Etc. As a professional physicist, I do not understand the purpose of sites like this one. Professionals live from their work, the contemporary physicists don't - they just consume public taxes. I admit, the researchers like Faraday or Tesla were able to live from their findings - but the contemporary parasites, who just censor and boycott the findings and ideas of others? Sorry, I've different opinion about what the professionalism means. There you go cantdrive, another obscure, well something, for you to get behind. SchadenfreudeX: we need more scientists to take an interest in sites like this, not withstanding the crackpots, conspiracists and imbeciles that try to overwhelm their voices of reason. The crackpots are getting away with their garbage because not enough scientists are patient enough, nor thich skinned enough, to take on these purveyors of lies and ignorance. I hope you add your voice. The best way to show the monster in the darkness is not to be feared, is to shine light upon it. http://www.21stce...ents.pdf Here is what the greatest 19th century thinker had to say on the cyclical nature of physical systems. And some out themselves as being reprehensibly ignorant of real scientific discovery. Yes, Maggnus, but why let them in here? Traditional scientific journals never let them in, that is why nutters had to start their own crackpot-friendly 'journals' such as Progress in Physics, etc. What is needed is a super-internet where real scientists can interact without being bothered by the loony-tunes. cantdrive-cantthink Oh, you mean the theories that have no supportive evidence and the experiments that can be replicated only by a few close friends. Funny how those 'real discoverers' can never quite manage to acquire the skills and modesty that might earn them a hearing from the academic world. I was actually referring to the substantial discoveries both of the mention gentlemen were responsible for. If you want to change the subject and make erroneous claims about the EU, at least make accurate ones. Any real examination of the facts will reveal it is your claim that lacks merit, not the theory. Good question, and I wish I had an answer for you. A crisis of identity maybe, trying to pander to everyone, or perhaps a misguided desire for the appearence of even-handedness. A lack of moderation seems to be a real issue. Or, perhaps a lack of guidelines for the moderators? @Your comments have nothing to do with article subject, so you should be moderated first, if you're asking for it. Whole this page of posts doesn't belong here. Feel free to go to the EU site and participate. Show them where they are wrong, but you had better change your tactics of bashing and ridicule. You're free to exchange what ever scientific POV you choose, but the moderators would delete most of the BS you people post. There seems to be zero moderation on this site, feel free to ridicule, demean, name call, curse, advertise, or whatever you so choose to establish your superior POV. History will show who chose the scientific route, and who chose pseudoscience. From the first space probes that confirmed predictions by Birkeland and Alfven to the Voyager and Deep Impact that continue to confirm EU predictions today, the EU is here to stay. So we have Sun the star and we have largest Jupiter the planet with orbital period 11 years. Now after two hundreds years of research some physicists propose, that this periodicity has a "magnetic origin". What we should think about it? It used to be better site, before the creationist and climate skeptic personnas got organized. The moderators let it slide because conflict sells pageviews and advertising; as the non-partisan professional readership left, I think phys.org started taking fees for straight-up promotional material from various educational and corporate technology sources. There also seems to have been some kind of outsourcing of the writing. There have been some amazing mistakes and misinterpretations in posted articles that were a result of literate but perhaps .. nontechnical .. writers. Put it together, and it debases the readership. This is what you get for free. Sciencedaily is less irritating for the non-professional these days. After thinking over the comments on this thread, I am reversing my opinion regarding the moderation here. This site is actually performing a really good service, in that, it is giving air to the crackpots and nutcases in all of their glory. This is allowing these pretend prophets to be held up to the full scutiny and ridicule of the scientific community. I was thinking this over last night, and I'm of the opinion that having a place that doesn't encourage such posters, but doesn't censor them either is a better way of dealing with the myriad of pseudo-scientific claims that are circulating on the internet. It allows those claims to be put under the harsh light of reality and scientific scutiny and to show how truly mistruthful they are. And leaving the conversations, warts and all, shows that there can be no allegations of censorship or editing because its all right there to read. debunk the pseudo-science that these purveyors of lies and snake oil DO continually misrepresent themselves and the pseudo-science they seek to promote by repeating their mantras from topic to topic unmindful of the corrections and the pointing out of the junk-science they depend on to keep their claims alive. Those who do real science are not fooled by the pseudo-scientific claims, but it is not them that are being targeted! The targets are the less sophisticated and our children. I contend that having a site that promotes scientists to come and express their true veiws of the garbage that is spewed by the Zephyrs and Cantdrive85s and Reg Mundys of the world is a good thing. Keep in mind that some of these promoters of pseudo-science talk a good game that can deceive their target audience. Allowing scientists to set out clearly their disdain and contempt may cause the targets to look beyond the cries of suppression made by these charlatans. What do y'all think? Saying that is not the same as showing or explaining that. and also why ALL of the information we have ever gathered was recorded in the electroMAGtNETIC spectrum. Gravity is also a magnetic effect. Does one side (the magnetic north pole) of the earth pull the moon toward us and the other side (the magnetic south pole) push it away? Why don't circumpolar satellites crash after one orbit? Why does a person at the north pole not float up while a person at the south pole rest firmly on the ground? Or reversed? Why does gravity always work in one direction and and magnetic things in two? Where are all the magnetic monopoles that are necessary if all matter is inherently magnetic? An electromagnetic - gravity connection has been worked on by many very brilliant people. Read their work first, Lapoint's problem is he never took the time. 1)Sun was produced by reproduction process,while the first original stars were produced by symbiontic process (as cell system had two process of formation). Yes, turtles did it. Turtles all the way down. As for electricity and magnetism, I just love it when the EU nut-jobs get all confused about terms. There's a difference between electrostatic charge and electricity. Electrons are charge carriers. When they move, that is electricity, which generates a magnetic field. On the other hand, you can use a magnetic field to cause electrons move, so it goes both ways. Magnetism isn't the only way to make electrons move though, as demonstrated by your everage chemical battery. Maxwell's equations describe the ways that electricity and magnetism can interact. Electromagnetic potential, or the ability to do work, is entirely different than EM charge. Ohm's law describes how EM potential can be used to do work. Combine that with Maxwell's work for more complicated stuff. Electrons are charge carriers. When they move, that is electricity, which generates a magnetic field. On the other hand, you can use a magnetic field to cause electrons move, so it goes both ways. There is no confusion here, if you haven't been paying attention this is exactly the EUT's POV. As the electrons move the toroidal fields constrict the plasma into filamentary structures, just as is observed. And those currents carry a great deal of energy with the ability to do a great deal of "work" as well, they are not just inert currents that do nothing. It's not surprising that so many stellar/galactic objects have polar "jets". The galaxy or star is just the work getting done by plasmoids created by kink instabilities in those plasma filaments. This video explains the POV, which seems to be confirmed by the evidence that's available. You may as well argue that Zeus is the one throwing the lightning bolts that make up this current. That idea would at least have some historical background to support it. Also, the idea of Zeus being the cause is hard to argue against, while your idea is easily disproven by simple facts. I've gone over several indisputable reasons that you must be wrong, yet your simplistic view of physics allows you to maintain this fantastic belief structure. In one breath you argue that all of established science is wrong, then you conjure up some part of Ohm's law to support yourself. Yet you don't really understand Ohm's law or the implications. There is no confusion here, if you haven't been paying attention this is exactly the EUT's POV. See, he doesn't even know that he is confused about the terms after being told multiple times that he is confusing them. Cantdrive, look here, I've explained the contradictions of your theories many times. The fact that you don't see why some parts of your theory contradict with other parts is because you don't fully understand what you're talking about. If you won't bother to read up a bit, then you'll never understand why the things you say don't make any sense. The funny thing about it, is that you keep arguing against GR, but it doesn't take any part of GR to prove the EUT wrong. Simple natural laws like entropy and conservation of momentum is all it takes, as I've wasted my time trying to explain to you several times. Because your grasp of the basics is so weak, you can't see the many fatal flaws in your EU theory. That is a shame. So I guess magic is responsible for the magnetic fields produced everywhere in the Universe, this is essentially the POV of the "standard theory". How exactly does Ohm's law prevent currents to flow in plasma? Right, only when you incorrectly treat it as a "hot gas". I don't try to point out the failings of GR to support EUT, I point them out to show how remarkably UNSCIENTIFIC the hypothesis really is and the complete stupidity of those who worship in the church of Einstein. Solar heartbeat: doesn't that make Sol a cephid variable? Hey! I think I may have spotted your problem! As a professional physicist, I do not understand the purpose of sites like this one. Professionals do not need the input of amateurs, but amateurs MIGHT learn something from professionals here IF it were not for all of the loonies who get in the way. Wow, that's some real arrogance you got going there, bub! I'm sure learned and degreed "Flat Earthers" throughout history have felt much the same way. You sure you want to plant your flag on that hill? I think you are mistaken. But if you care to look further in that same general direction, please check out http://dipole.se (a site I am not associated with but nonetheless recommend). I think Bengt Nyman makes a good case for gravity being an electrostatic (not electromagnetic) effect created by "charge posturing" amongst quarks.